This was on our bucket list last year, but we never quite made it. This year, we prioritized and put it right at the beginning of summer, and boy are we glad that we did! 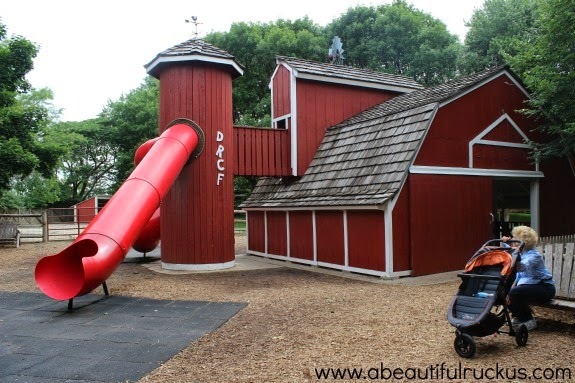 The Deanna Rose Children's Farmstead is across between a living museum, a petting zoo, a giant playground, and a working farm. The kids loved it, and we didn't even get to see everything on the day that we went. What's even better is that admission is free Monday-Thursday, so we can "afford" to return again! Caleb quickly decided that there were too many people and that the situation was too foreign for him. Unfortunately, it only took...3 minutes for him to start isolating himself like he does when he is overstimulated. :( But we were determined to keep going. 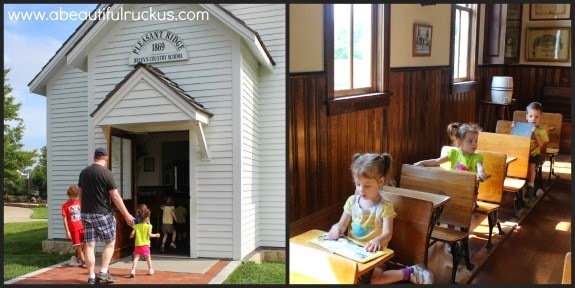 One of the living history buildings was an old schoolhouse that even had a role-playing teacher inside! 3 out of 4 kids gave it their stamp of approval! Unfortunately, Daddy and Caleb missed this part because our little guy was having trouble coping with his surroundings. 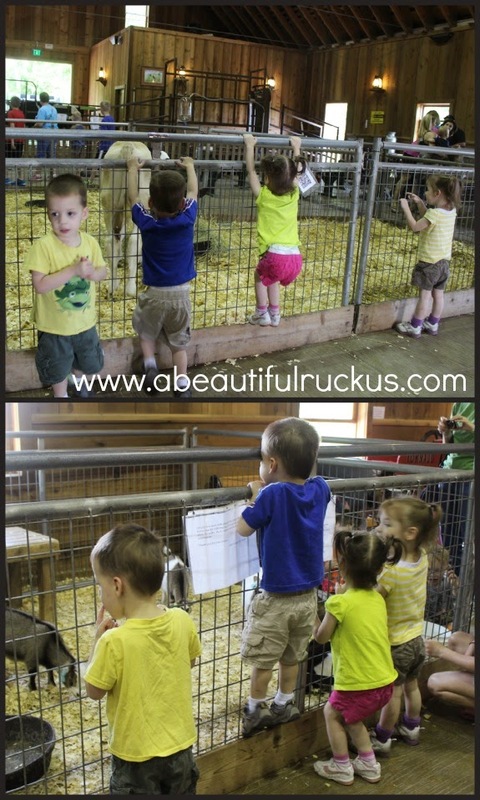 Then we went to go see the "baby cows" and "baby goats!" 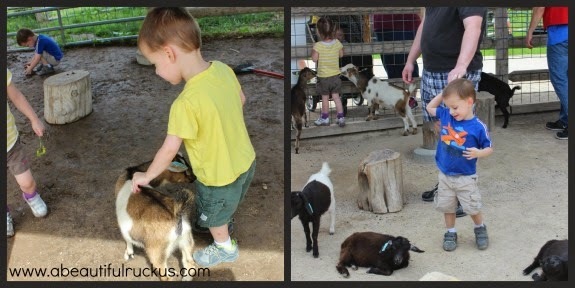 Then we headed to the baby goat pen to do some petting! I'm happy to see that our kids aren't afraid of animals. 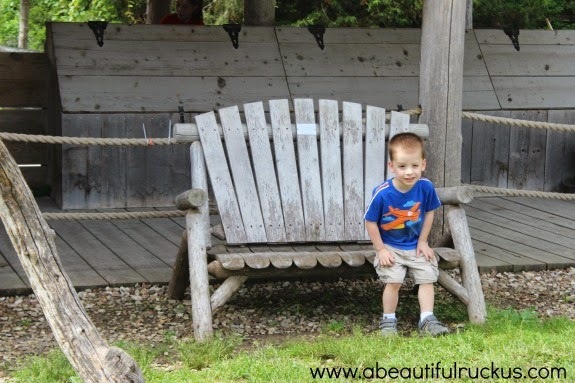 One of our last stops was the children's garden. We spent a lot of time playing here, and everyone enjoyed it (even Caleb!). Plus I snapped these photos of the girls! Lol! They didn't realize that you are supposed to look through the hole. They just did it because they were curious what was on the other side. Have I mentioned how much I enjoy having a camera with a fast shutter? A smart mom never goes on an adventure without snacks for the family. 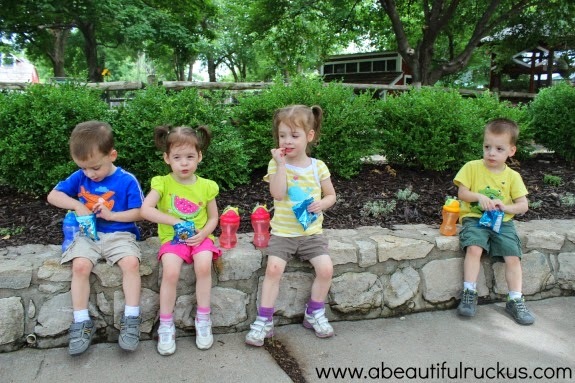 The kids were pretty worn out by this point, so snack time made for four very happy children! I also brought some of their special teddy graham snacks with us that they don't get very often, so snack time was extra appealing. It's possible that Sean and I were as grateful for the break as they were. Our final stop was this ginormous barn slide. 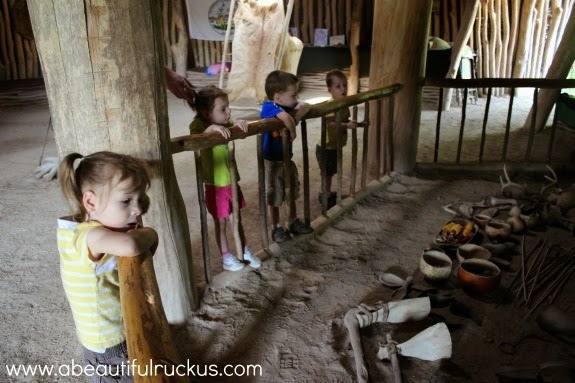 This was, hand's down, the very most favorite part of the adventure for our kids! They ran up the stairs and slid down non-stop until a bunch of big kids showed up and started to run our little guys over (not on purpose. Our kids are just so small!). Sean stood on one side of the barn, and I stood on the other, and between the two of us, we were able to keep them in sight. The kids were just happy to run and play (and we were happy not to chase them!). 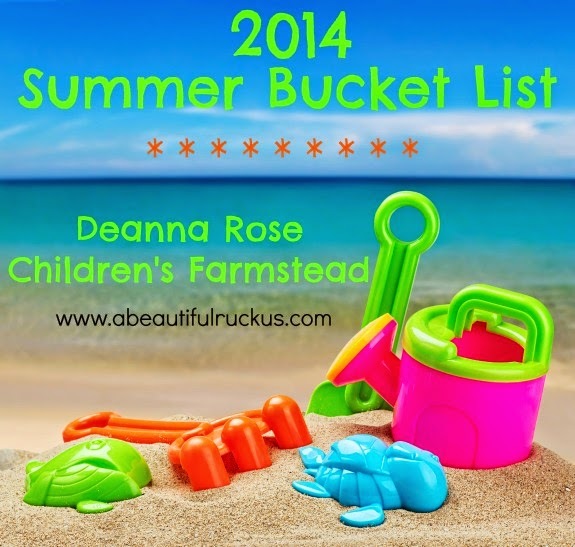 We added Deanna Rose to the beginning of our summer adventures to make sure that we fit it in, but all it did was let us know that we will most likely be back several more times before the summer is over. 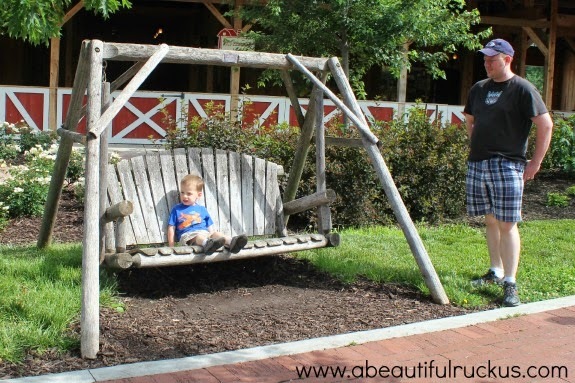 It's an awesome place to go with little ones since everything is sized to them! What a great place to go and for free too! That is wonderful! 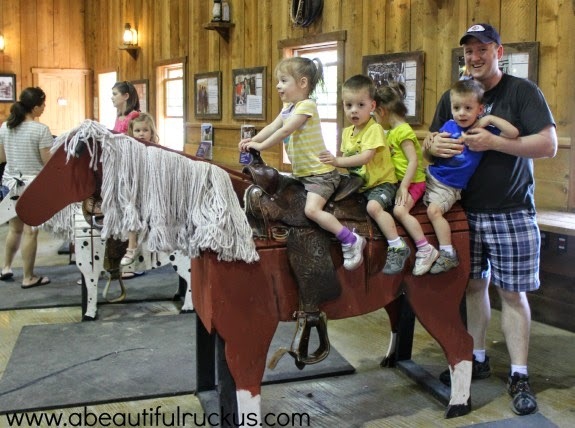 Looks like your kids had fun; love the pic of them all together on that horse. Hee Haw! We no longer live near Kansas City and this is one place I really miss. 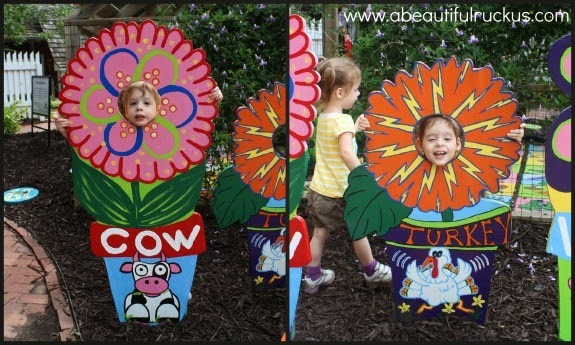 My kids loved it every time we went. Glad your family enjoyed it too! Looks like an awesome place! Do you mind sharing what camera you use? 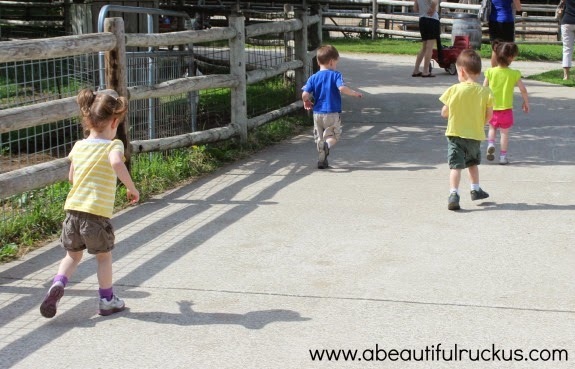 I have a horrible time getting good pics of my kids because they are always moving! Thanks! I love this place! We took my nephew last year and he had a blast. So affordable and great entertainment.